There are 5 new Grocery offers from SavingStar available from today. You can save on Quilted Northern, Nexium, Emergen-C and more. Save 50¢ on any ONE (1) QUILTED NORTHERN® Bath Tissue, 12 Double Roll or larger..Expires 7/24/2018.Save $0.50. Save $1.00 off ANY ONE (1) Emergen-C® 8ct or larger..Expires 7/8/2018.Save $1.00. Save $5.00 on any ONE (1) 28 ct. or 42 ct. Nexium® 24HR Product.Expires 7/8/2018.Save $5.00. 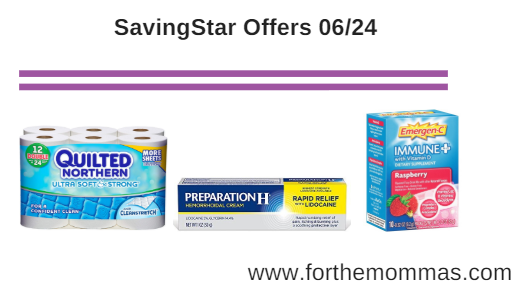 Save $5.00 on ANY ONE (1) PREPARATION H® Rapid Relief 1 oz or 0.75 oz product..Expires 7/7/2018.Save $5.00. Save $1.00 on ANY ONE (1) PREPARATION H® product..Expires 7/7/2018.Save $1.00.